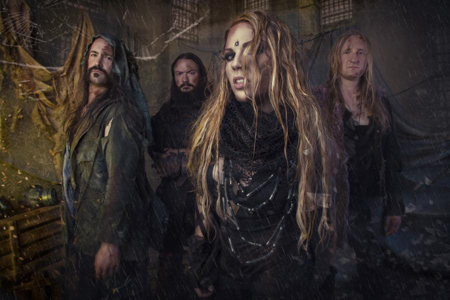 Kobra And The Lotus will soon deliver the second part of their opus magnum, one year after the successful release of rock juggernaut 'Prevail I'. Today, the first track from 'Prevail II', 'Losing My Humanity', has been released and is premiering right now here on MetalTalk. "Ignorance is bliss. This song is the cynical point of view regarding the ways of human nature. We pretend we've been different but throughout history we have always been a barbaric and brash species. "The silence kept during times of pain or unjust suffering is profoundly loud. Does it make us better when we stand by and say or do nothing when we know something is wrong? I would argue it makes us almost the same. "Take the words figuratively or literally, I'm just calling it as I see it, even if it's me taking a clear look at myself in the mirror." 'Prevail II' continues right where Kobra And The Lotus left off in 2017 and is set for a release on April 27th 2018 with Napalm Records. The band recently unveiled the cover artwork and tracklisting for their hotly anticipated new a\lbum. "Humanity. One of the greatest struggles of our human existence is to retain it. This sequel album takes a deeper dive into the darkness of our psyche and explores the personal torment and struggle we inflict upon ourselves, one another, and the earth. "It has become common place for people to give up on themselves and lose their belief in their abilities and self-worth. This in turn affects our daily actions/behaviour. We are a cripplingly, self-harming species BUT we are also profoundly capable beings of altruism, evolution, and positivity. "This album will close the 'Prevail' double sequel on the lightest of all notes by acknowledging that every single person has a desire to be and deserves to be truly seen, loved, and heard. When the ignorance is cleared, we can recognize that we are all in this together." With 'Prevail II' Kobra And The Lotus deliver the grande final to their emotional and musically diverse 'Prevail' series while showing all of the band's facettes at its best. Many more Kobra And The Lotus dates to be announced soon.